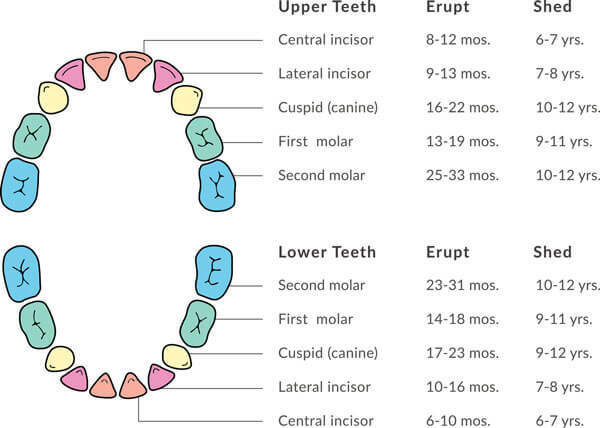 Tooth eruption begins around the age of 6 months and can last until the age of 3 years. During this stage, your child’s gums may be sore and irritable. You can soothe them by gently rubbing the gums with a cold, wet cloth, the back of a cold spoon, or a clean finger. A child’s central teeth, both upper and lower, are the first to appear and then other teeth erupt sequentially moving toward the back of the arch. The exception to this is the first molars, which typically erupt before the cuspids (canines). The first teeth to erupt are the lower and upper central incisors, which erupt between the ages of 6 12 months. The next to erupt are the lateral incisors between 9-16 months, followed by the first molars from 13-19 months. Next, the cuspids (canines) erupt from 16-23 months. Lastly, between 23 and 33 months, the second molars erupt. Children typically begin shedding their primary teeth at the age of 6 years, starting with the central incisors and followed about a year later by the lateral incisors. The first molars are shed next, closely followed by the lower canines. The upper canines and both upper and lower second molars are shed last.